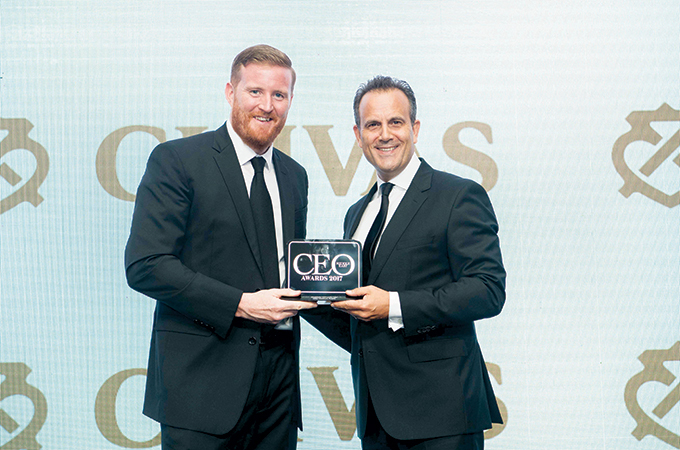 Rotana added yet another prestigious accolade to its long list of accomplishments when its president and CEO Omer Kaddouri was honoured with the ‘Hospitality CEO of the Year’ award at the CEO Middle East Awards 2017. A Rotana veteran, Kaddouri has been with the company for nearly two decades and has served as president and CEO since January 2014. Kaddouri’s strategic vision and hands-on leadership have been instrumental in reinforcing Rotana’s preeminent position in the region’s hospitality landscape, with his emphasis on customer centricity, market-based strategic planning and diversified business development enabling the company to achieve sustained growth and expansion amid a tough operating environment. “I’m deeply honoured and humbled to accept this award,” Omer Kaddouri said. “I dedicate this honour to all my wonderful colleagues at Rotana, without whose hard work, commitment and professionalism Rotana wouldn’t have become one of the industry leaders it is today. “This award is a testament to Rotana’s sound business model and its commitment to putting market insights and customer needs at the heart of decision-making. More importantly, it reiterates that we as a company are on the right track toward achieving our goal of operating 100 properties worldwide by 2020,” Kaddouri signed off. The recognition has come after a long and exacting process of evaluation. The judging committee took into account Kaddouri’s overall stewardship of Rotana and his contribution to improving organisational performance across key areas such as financial performance, business growth and expansion, technology adoption, social and environmental sustainability, and employee development. Last year, despite the hospitality industry having been hit hard by slowing global economic growth and declining oil prices, Omer Kaddouri was able to ensure that Rotana hotels maintained their market share and achieved high occupancy levels on par with 2015. As business from traditional source markets such as Russia and China dwindled, Kaddouri’s strategic dexterity and deep understanding of the hospitality market was brought to the fore as he led an aggressive push to create a more diversified mix of feeder markets. Due to these efforts, Rotana was able to generate increased business from countries in the Eastern European region, thus helping offset the decline in arrivals from its stronghold markets. At the same time, Kaddouri managed to move the company further along its ambitious growth and expansion plan. During 2016, Rotana opened six new hotels, and signed management agreements for nine new hotels, to consolidate its leadership position in the region. Kaddouri also initiated several measures aimed at strengthening the market positioning and appeal of Rotana’s diverse mix of F&B offerings, and his commitment to using technology to deliver improved guest experiences led the company to boost its online presence and introduce a series of social media-focused innovations. In keeping with his belief that human resources will remain a key factor in the growth of the company, Kaddouri led several initiatives involving the retention and succession planning of colleagues. Most notable among these is the TAROT (The Accelerated Refinement Of Talent) programme, which targets ambitious university graduates as well as passionate existing team members who Rotana believes have a bright future. In the course of his distinguished career, Kaddouri has received several industry awards and has also been recognised by Switzerland’s prestigious Les Roches International School of Hotel Management with an “Innovation Award” for his outstanding contributions to the hospitality industry.